The slogan is "Charitable Giving Never Tasted Better" and I tell ya, the organizers and participants of Bon Appetit have nailed it. The bash was held once again in the spacious and well-organized Ernst & Young Centre (formerly the CE Centre in 2012; will they have another name change for the 2014 edition of the show? We shall see.) And once again I enjoyed FAHbulous company with one of my favourite wineaux/foodie/supermoms, who, like me, saw this as not only a fun (and most definitely well-deserved) night out, but a mission to discover the next new, tasty morsels Ottawa could offer. Any night that starts off with a pink-lemonade frosting shot and gingerbread popcorn (both courtesy of the Flour Shoppe) is going to be a good night. Todrics Catering wowed me with a mango and coconut puree; the peanut-butter-crunch cake from It's A Matter of Cake was blissful. Got the meat sweats with the Real Sports Bar Triple Threat (pulled pork, brisket and back bacon on a bun) and washed everything down with some old-school cream soda from Kichesippi Beer's new venture, Harvey & Vern's sodas. Discovered Rosewood 2010 Natalie's Sussreserve Riesling (Beamsville, Niagara Peninsula; 11.2% abv; V258806) - Tart green apple leading into a surprising burst of juiciness accentuated by a fine fizz. This was not at all what I would expect from a riesling, which made me want it even more. "Sussreserve" defines the process that involves leaching off some of the juice and keeping it tightly under wraps while the rest of the fruit goes through the usual fermentation. Towards the end, the separated liquid is re-introduced, giving the final wine its distinct lush mouthfeel. Also had a chance to try a few exceptional brews, most notably Spearhead's Moroccan Brown Ale, made from figs, dates and raisins, spiced with a dash of cinnamon. Their tasting notes compare it to a complex red wine, and they're bang-on: it kept evolving as it warmed in the glass, giving off the rich, soul-satisfying flavours of the dried fruits. I was into the desserts by that point and found this went along nicely with the squares and brownies loaded on my plate. 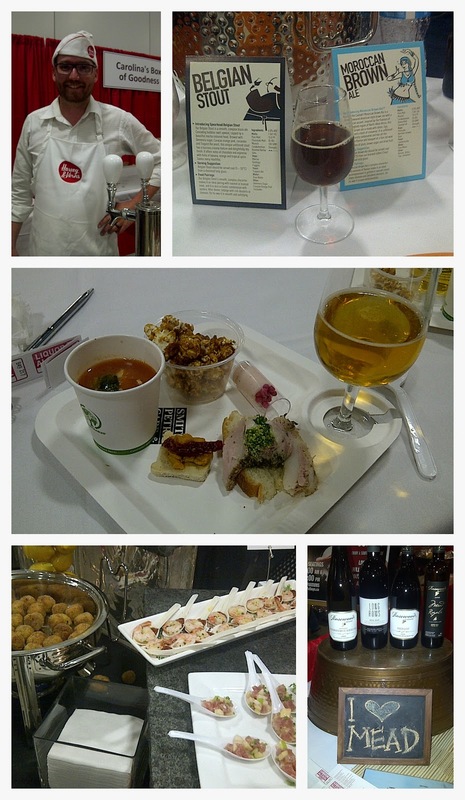 Other mention-worthy beers included Summer Weiss by Muskoka Brewery and Cassel Brewery's Hopper IPA. Thumbs up to the hard-core brigade of volunteers keeping everything clean and guests informed; thumbs down to the compostable plates—they may be good for the environment, but after a couple loads, they start getting dangerously soggy. Heard more than enough glasses shatter throughout the night owing to a plate that just couldn't hack it. Till next year, I bid you bon appetit!